Dental disease is one of the most common reasons pet rabbits present to veterinary clinics. It can produce a wide variety of clinical signs and varies in severity. Although the underlying cause of dental disease can be congenital or traumatic, husbandry is a major influence in the prevention, onset, and treatment of dental disease. When rabbits are fed an inappropriate diet, their teeth can overgrow, resulting in malocclusions and other abnormalities. The goals of treatment are to return teeth to their normal anatomy and to control inflammation and infection, thereby returning the teeth to normal function. Veterinary technicians play a vital role in educating rabbit owners about prevention and early detection, as well as assisting veterinarians with diagnosing and treating dental disease. FIGURE 1. (A) Cheek teeth. (B) Diastema. (C) Four maxillary incisors, including the 2 smaller peg teeth situated directly behind the larger set of incisors, and 2 mandibular incisors. Note the chisel-like appearance of the incisors and the occlusion of the mandibular incisors to the peg teeth. FIGURE 2. Craniocaudal view of rabbit skull. When the jaw is at rest, the cheek teeth do not touch. This is due to anisognathism (mandible is narrower than the maxilla). Congenital causes include prognathism, brachygnathism, and other jaw malformations.2 For example, a malformation of the incisors may cause improper wear of the cheek teeth, eventually leading to the development of sharp points and overgrowth of the cheek teeth. Alternatively, a malformation of a cheek tooth may cause improper occlusion of other cheek teeth or the incisors, causing improper tooth wear and overgrowth. FIGURE 3. The roots of the maxillary cheek teeth are in close proximity to the periorbital space. FIGURE 4. 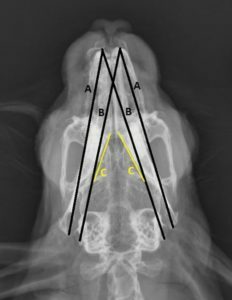 Demonstration of the use of a bivalve nasal speculum during an oral examination on a rabbit. Every rabbit that presents to the veterinary hospital should undergo a physical examination that includes an oral examination. Early detection of dental disease increases the probability of successful treatment. The success of performing an oral examination on an unsedated rabbit varies depending on the stress level and cooperation of the rabbit. 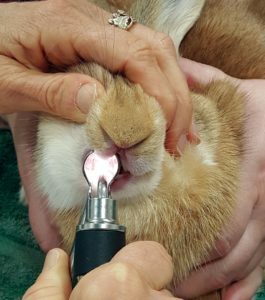 If dental disease is suspected, a more thorough oral examination should be performed with the patient under anesthesia.1 Rabbits with advanced dental disease commonly present with anorexia, pain, gastrointestinal stasis, or other secondary illness. These patients require anesthesia to perform a thorough, stress-free oral examination. FIGURE 5. The incisors are examined by pulling the lower lip down with the thumb and forefinger of one hand while using the thumb and forefinger of other hand to pull the upper lip up and aside. Radiography is an essential diagnostic tool that should be performed for all patients with suspected dental disease.1 The bulk of the teeth and the supporting structures is below the gumline, hidden from view during gross oral examination. The tooth roots, jawbone, periodontium, nasolacrimal canal, and intra-alveolar portion of the teeth can only be examined radiographically. 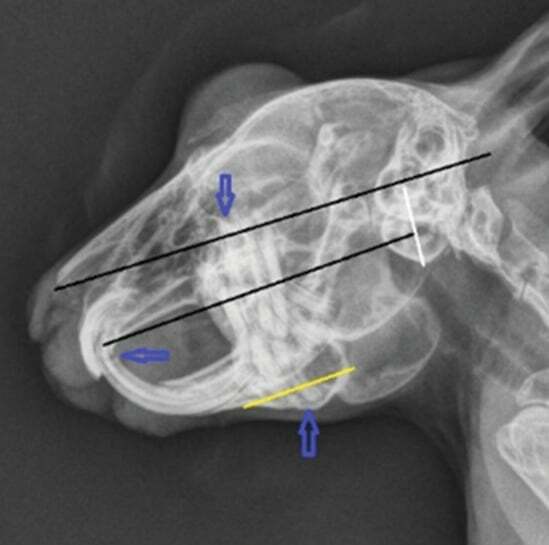 Changes to these structures account for 80% of dental disease.1 Radiographs also provide the veterinarian with information on treatment options and long-term prognosis. Proper positioning of the patient is vital for correct interpretation of radiographic images.1,2,7 It may be necessary to sedate or anesthetize the patient to reduce patient stress and to obtain correctly positioned, symmetric radiographic images of the skull.1,2,7 The standard projections needed for thorough evaluation of the oral cavity of the rabbit are a laterolateral skull view, dorsoventral or ventrodorsal skull view, and right and left 40º oblique skull views.1,2,7 BOX 1 provides positioning guidelines. Place the patient in lateral recumbency. If applicable, position the affected side nearest to the cassette. Pull front limbs caudally and extend the head. Use foam pads, rolled hand towels, or tape to assist with positioning the rabbit’s skull perfectly horizontal to the table. 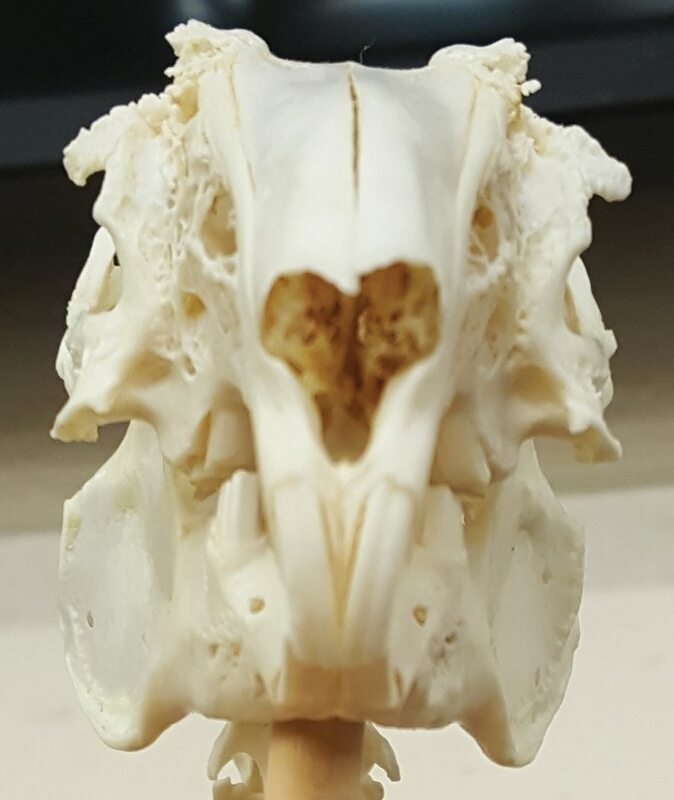 Vertically position ventral margins of the mandible and both eyes. In some patients, it may be useful to open the mouth slightly with a small cotton prop to separate the occlusal surfaces of the maxillary and mandible teeth. Place the patient in sternal recumbency. The front limbs can remain in natural position; ensure they are out of the x-ray beam. Use sandbags to apply gentle pressure to the back of the patient’s neck to ensure the head is not tilted ventrally. Use tape or foam wedges on either side of the head to prevent rotation if necessary. If positioned correctly, both of the patient’s eyes will be horizontal to the table. Place the patient in dorsal recumbency. Use V-trays and foam wedges to prevent rotation of the patient. Pull the front legs caudally. Use foam or rolled hand towels to support the neck of the patient and tilt the patient’s nose toward the table top, achieving a ventrodorsal position. The ventral lower jaw should be horizontal to the table top. Place the patient in lateral position. Pull the front legs caudally and extend the head. Rotate the patient’s head 40˚ away from the table. Repeat with the patient in lateral position on the opposite side. A black line (A) extends from the tip of the nasal bone to the occipital protuberance. The roots of anatomically normal maxillary cheek teeth will not extend past this line. The white line extends the height of the tympanic bulla. A second black line (B) runs parallel to the first, extending from the rostral end of the hard palate to one-third of the height of the tympanic bulla. The occlusal surface of the cheek teeth will appear to match this line in healthy rabbits. A yellow line (C) highlights the mandibular cortical bone. The roots of anatomically normal mandibular cheek teeth will not extend past this line. A black line (A) extends from the lateral margin of the mandibular incisors to the medial margin of the mandibular ramus on the same side. 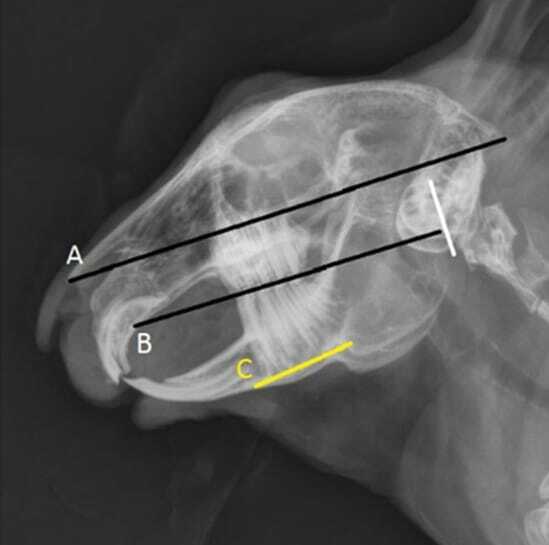 Another black line (B) extends from the lateral margin of the mandibular incisors to the lateral wall of the tympanic bulla on the opposite side. Cheek teeth should not extend outside of these reference lines. Two yellow lines (C) highlight the medial cortex of the mandible, which should appear straight, smooth, and symmetric. Treatment of dental disease consists of returning teeth to their normal length, restoring normal occlusion, extracting diseased teeth, and treating associated abscesses. FIGURE 6. Common dentistry equipment. A. Molar cutters. B. Spatulas. C. Tabletop mouth gag. D. Mouth gag and cheek dilators. E. Dental handpiece and cheek guard. F. Dental burs. G. Incisor luxator. Dental disease is profoundly common in pet rabbits. Although it cannot be prevented in all pet rabbits, feeding a high-fiber diet and providing objects to encourage chewing are positive preventive practices. Annual physical examinations of pet rabbits assist in early detection of dental disease. Veterinary technicians play a critical role in educating rabbit owners about early clinical signs of dental disease, as well as diagnostic modalities and treatment options for a pet rabbit with suspected dental disease. Recognizing and assessing pain in small mammals can be challenging. As prey species, small mammals mask signs of illness and injury, especially when in an unfamiliar environment. The International Association for the Study of Pain (IASP) describes pain as “an unpleasant sensory and emotional experience associated with actual or potential tissue damage.”1 Lichtenberger and Ko indicate any “animal should be assumed to be experiencing pain in any condition expected to produce pain in human beings.”2 Therefore, when working with a patient, it is reasonable to ask yourself, “Would this illness or procedure cause me to feel pain?” If your answer is yes, then it is likely the illness or procedure will also cause the animal pain. History and husbandry information about the patient should be obtained from the owner using open-ended questioning techniques upon arrival at the veterinary clinic. Since the patient will most likely be masking any signs of illness or discomfort, information obtained from the owner about how the animal has been acting in its normal environment will be helpful. The interview process also allows time for the animal to become accustomed to the veterinary clinic setting. Observation of the patient during the interview or in a quiet room before handling may reveal signs of pain or discomfort. If a small mammal is unable to mask clinical signs of pain and discomfort, it should be considered severely debilitated. Various species and individuals have different pain responses and pain tolerance.4 Rats have a harderian gland that secretes red, porphyrin tears when they are ill or stressed, giving the appearance of bleeding eyes. Guinea pigs and rodents may display piloerection. Guinea pigs, which normally give high-pitched squeals when handled, also tend to be quiet during handling while painful. Ferrets are reluctant to curl up while resting and commonly squint their eyes. Other animals, frequently rodents, spend more time than normal curled up and may have bulging eyes. Overgrooming, chewing at the location of pain, and self-mutilation are observed in small mammals, most commonly in rodents and sugar gliders. 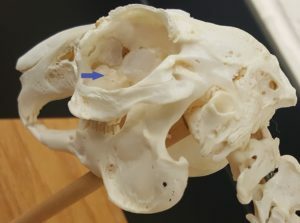 Appropriate multimodal analgesia techniques can and should be used in small mammals. The veterinary technician oath states, “I solemnly dedicate myself to aiding animals and society by providing excellent care and services for animals, by alleviating animal suffering, and promoting public health.”5 Veterinary technicians play an integral role in recognizing pain in patients and act as patient advocates to alleviate pain and suffering in all animals. Merskey H, Bogduk N, eds. IASP Taxonomy. International Association for the Study of Pain. iasp-pain.org/Taxonomy#Pain. Accessed October 2016. Pollock C. Pain management in small mammals. LafeberVet; April 23, 2011. lafeber.com/vet/pain-management-in-small-mammals. Accessed October 2016. Manicinelli E. Recognising and managing pain in small mammals and exotics. Vet Times November 1, 2011. vettimes.co.uk/article/recognising-and-managing-pain-in-small-mammals-and-exotics/. Accessed October 2016. The Veterinary Technician’s Oath. Oklahoma Veterinary Technician Association. okvta.org/veterinary-technicians-oath.html. Accessed October 2016. Boehmer E. Dentistry in Rabbits and Rodents, West Sussex, UK: Wiley Blackwell, 2015. Lennox A. Diagnosis and treatment of dental disease in pet rabbits. J Exotic Pet Med 2008;17(2):107-113. 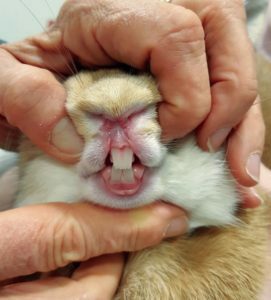 Brown S. Rabbit dental disease. VeterinaryPartner.com. 2001. VeterinaryPartner.com/Content.plx?P=A&A=472. Accessed October 2016. O’Malley B. Clinical Anatomy and Physiology of Exotic Species, St. Louis, MO: Elsevier Saunders; 2005. Harcourt-Brown F. Textbook of Rabbit Medicine, Woburn, MA: Reed Educational and Professional Publishing; 2002. Harcourt-Brown F. The progressive syndrome of acquired dental disease in rabbits. J Exotic Pet Med 2007;16(3):146-157. Boehmer E, Crossley D. Objective interpretation of dental disease in rabbits, guinea pigs and chinchillas. Use of anatomical reference lines. Tierarztliche Praxis 2009;37:250-260. Lavin LM. Radiography in Veterinary Technology. 3rd ed. Philadelphia, PA: Elsevier; 2003. The term _________ means the teeth have open apices, never forming true tooth roots. The term _________ means the teeth continually grow throughout the life of an animal. In a normal, healthy rabbit, the teeth wear down _____ mm per week. 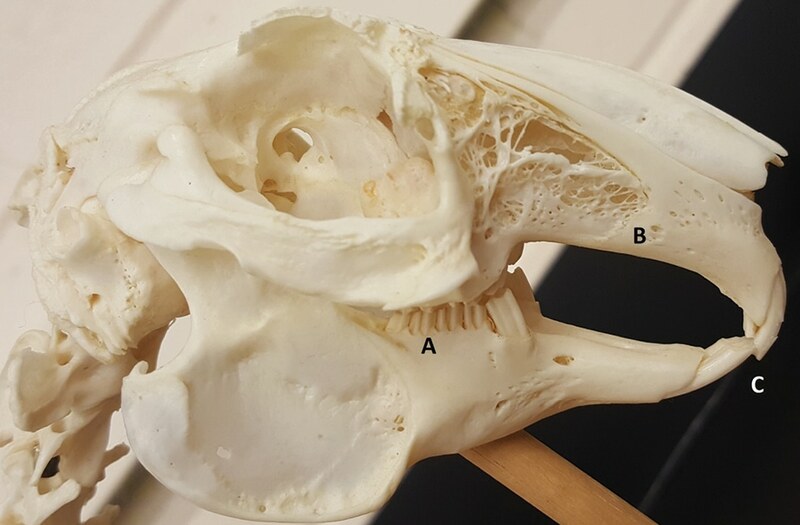 Which of the following is a congenital cause of dental disease in rabbits? uneven occlusal surface of cheek teeth. labial points on occlusal surface of cheek teeth. _________ skull radiographic views often yield the most valuable information regarding dental disease in rabbits. _________ is not high in fiber and does not encourage the grinding motions of the jaw that benefit tooth attrition in rabbits.